It’s an instant mixing powder formula that contains three essential amino acids (leucine, isoleucine and valine) in a 4:1:1 ratio. 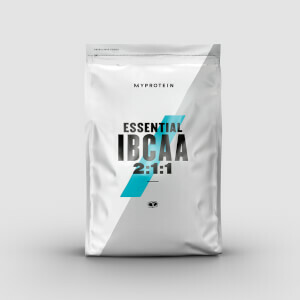 iBCAA is an instantised form of branch chain amino acids (BCAAs), which make up approximately 35% of the essential amino acids in muscle proteins – making it an important recovery tool after a hard-hitting workout. These all-important acids cannot be synthesised by the body, so must be consumed through your diet, and unlike other amino acids, they are Metabolized directly into the muscle. It offers you a quick and easy way to hit your optimum levels of branch chain amino acids – offering a super supplement that helps aid recovery across all types of sports and exercise. Who is iBCAA 4:1:1 suitable for? It’s the perfect choice for anyone taking part in intense training or exercise, to help you achieve your recovery goals. To reap the benefits of our BCAA 4:1:1 powder add 2 small scoops (5g) to 8 - 12 fl oz of water or juice in a Myprotein shaker before, during and/or after exercise. Sour Apple Flavor: Soy Lecithin, Flavoring, Sweeteners (Sucralose, Acesulfame-K), Colors (FD&C Yellow No. 6, FD&C Blue No. 1). Blue Raspberry Flavor: Soy Lecithin, Flavoring, Sweeteners (Sucralose, Acesulfame-K), Color (FD&C Blue No. 1). Lemon & Lime Flavor: Soy Lecithin, Flavoring, Sweeteners (Sucralose, Acesulfame-K), Colors (FD&C Yellow No. 6, FD&C Blue No. 1). Orange Flavor: Soy, Lecithin, Flavoring, Sweeteners (Sucralose, Acesulfame-K), Color (FD&C Yellow No. 6). Watermelon Flavor: Soy Lecithin, Flavoring, Sweeteners (Sucralose, Acesulfame-K), Color (FD&C Red No. 40). Raspberry Lemonade Flavor: Soy Lecithin, Flavoring, Sweeteners (Sucralose, Acesulfame-K), Colors (FD&C Red No. 40, FD&C Blue No. 1). Great value. Love the Taste. Mixes up better than most name brand aminos that I’ve used. Can get great deals if you pay attention to their sales. I don’t buy aminos from anywhere else. My score is 4 because the price is AMAZING! I've tasted tested 4 flavors now. Blue Raspberry is bland but ok. Unflavored has no taste and you get more per serving, since they don't have to include flavoring. Rasberry lemonade is alright tasting but does have a lingering after taste. Watermelon mixes poorly and tastes even worse. Did I mention the price was amazing? Anything to mask the flavor. Nice and sweet, great to sip on during the workout. Best value for BCAA's I have found that have been independently lab tested. Trust MyProtein over any other supplier and love the value. Great tasting BCAA's at a great price. Love the watermelon flavor, my favorite so far. Have also tried the blue raspberry and raspberry lemonade and have enjoyed these as well. Recommended for sure!